and ask very nicely for a reprint of Golden Age Aquaman stories, starting with his first appearance. If you aren't feeling as devoted to the idea, you can write an email, but a paper letter is more likely to get attention. You can also grab a copy of a recent DC book and write to the first few names after Dan Didio in the masthead. The more the merrier. When the prisoners on Convict Island see the allied fleet defeated in the distance, they overthrow their guards and declare Yascom the giant to be their king. The artwork changes in this story, and I can't say it's an improvement. Oh, it's not bad, but the previous artist had the ability to draw faces that looked different from one another. The faces in this story fit certain types. Adams is a dead ringer for Leef, except Leef has a moustache and a pith helmet. Yascom looks the same as most of the other prisoners, except for his silly crown. Aquaman takes Adams to his headquarters. But it's made absolutely clear in the opening that this is in the Pacific. That argues that Aquaman's home, and the city of Atlantis, are in the Pacific ocean. This would work with the third story, in which Aquaman brings Keoki of Pearl Island to his home as well. 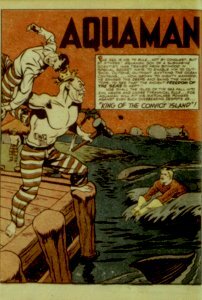 Yascom is a blacksmith, and a moment is spared from the story to show him making his crown... Aquaman comes to the island after an off-page adventure: "Having saved survivors of a sunken warship, he turns his attention to the drama on shore!"... The warship might have been from the battle the prisoners see at the beginning of this story... Aquaman and Adams first undermine Yascom's authority with tricks, then start a full-on rebellion... Yascom is very surprised that Aquaman survives being hit on the back of the head by Yascom's hammer, but he's smart enough to figure out that dry heat will kill Aquaman... This is the second time that heat/dryness are used as weapons against Aquaman, but there is no indication of any time limit... Adams tells Aquaman that his crime was stealing "some funds" and that he had repented and was willingly serving out his sentence. Why would a white collar criminal be sentenced to hard labor on an island in the Pacific? Finny Friends Report: A lobster grabs Yascom's crown when Aquaman sends him out on a line. A swordfish cuts the rock Aquaman is tied to away from the cliff, so Aquaman ends up in the water. A lobster cuts Aquaman free from the rock. Captured/Knocked Out report: Aquaman is knocked out from behind by a blacksmith's hammer. Ouch.